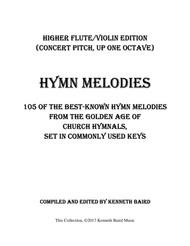 Hymn Melodies – Higher Flute/Violin Edition: 105 of the Best-Known Hymn Melodies from the Golden Age of Hymnals, Set in Commonly Used Keys. Composed by Various. 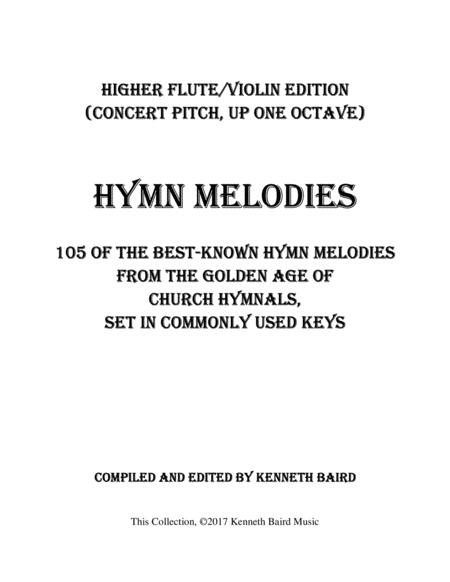 Arranged by Compiled and Edited by Kenneth Baird. Christian, Sacred, General Worship, Lent, Funeral. Score. 50 pages. Published by Kenneth Baird Music (S0.253775). Whether foryour personal time of praise & worship, for your own spiritual refreshment,or for practicing phrasing or transposition, this collection of hymn melodiesis sure to bless you. Contents include: Abide with Me; Alas! And Did MySavior Bleed? ; All Creatures of Our God and King;All Glory, Laud, and Honor; All Hail the Power of Jesus Name; Alleluia!Sing to Jesus! ; Amazing Grace; Are You Washed in the Blood? ; Be Thou My Vision; Beneath the Cross of Jesus; Blessed Assurance; Blest Be the Tie That Binds;Break Thou the Bread of Life; Christ the Lord is Risen Today; Church in the Wildwood,The; Church's One Foundation, The; Come Thou Fount; Come, Thou Almighty King;Come, Ye Thankful People, Come; Crown Him With Many Crowns; Dear Lord andFather of Mankind; Deep River; Draw Me Nearer; Eternal Father, Strong to Save; FairestLord Jesus; Faith of Our Fathers; For All the Saints; For the Beauty of theEarth; From All that Dwell Below the Skies; Glorious Things of Thee Are Spoken;God of Abraham Praise, The; God of Our Fathers; Guide Me, O Thou Great Jehovah;Have Thine Own Way, Lord; He Leadeth Me; Higher Ground; Holy, Holy, Holy; HowFirm a Foundation; How Sweet the Name of Jesus Sounds; I Feel the Winds of GodToday; I Have Decided to Follow Jesus; I Love to Tell the Story; I Need TheeEvery Hour; I Sing the Mighty Power of God ; Immortal, Invisible, God Only Wise;In the Garden; It is Well With My Soul; I've Got Peace Like a River; JesusCalls Us, O're the Tumult; Jesus Loves Me; Jesus Paid It All; Jesus Shall ReignWhere're the Sun; Jesus, the Very Thought of Thee ; Jesus, Thou Joy of LovingHearts; Joyful, Joyful, We Adore Thee; Just a Closer Walk With Thee; Just as IAm; Lead On O King Eternal; Leaning on the Everlasting Arms; Let Us Break BreadTogether; Love Divine, All Loves Excelling; Mighty Fortress is Our God, A; MyFaith Looks Up to Thee; My Hope is Built On Nothing Less; Nearer My God to Thee; Nothing But theBlood of Jesus; Now Thank We All Our God; O Come, O Come, Emmanuel; O For aThousand Tongues to Sing ; O God, Our Help in Ages Past; O God, Unseen, YetEver Near; O Jesus, I Have Promised; O Store Gud; O Worship the King; OldRugged Cross, The; Onward Christian Soldiers; Praise God, From Whom AllBlessings Flow; Praise Him! Praise Him! ; Praise to the Lord, the Almighty; Rejoice,the Lord is King; Rest in Me; Rise Up, O Men of God; Rock of Ages; Savior, Likea Shepherd Lead Us; Shall We Gather at the River? ; Softly and Tenderly, Jesusis Calling; Somebody's Knockin' at Your Door; Stand Up, Stand Up for Jesus; Standingon the Promises; Still, Still With Thee; Swing Low, Sweet Chariot; Take My Lifeand Let It Be; There is a Fountain Filled with Blood; Thine is the Glory; Thisis My Father's World ; Tis So Sweet to Trust in Jesus; To God be the Glory; Trustand Obey; Turn Your Eyes Upon Jesus; Were You There? ; What a Friend We Have inJesus; What a Mighty God We Serve; What Wondrous Love is This? ; When I Surveythe Wondrous Cross; When Morning Gilds the Skies. This edition in concert pitch, up 8va for high flute or violin.